MM's Kitchen Bites: Kozhi Thoran/Chicken Thoran (Chicken stir fried with grated coconut)...pet names!! 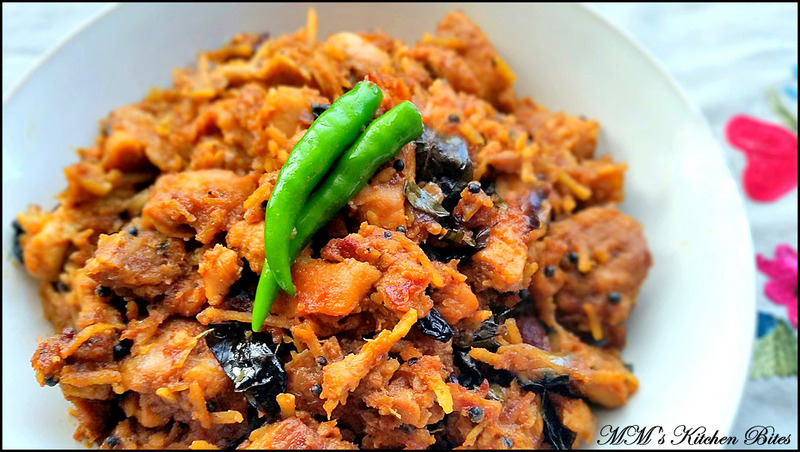 Kozhi Thoran/Chicken Thoran (Chicken stir fried with grated coconut)...pet names!! Rub the chicken with coriander powder, turmeric, red chili powder, kashmiri red chili powder and garam masala and leave to marinate for a couple of hours to overnight in the refrigerator. 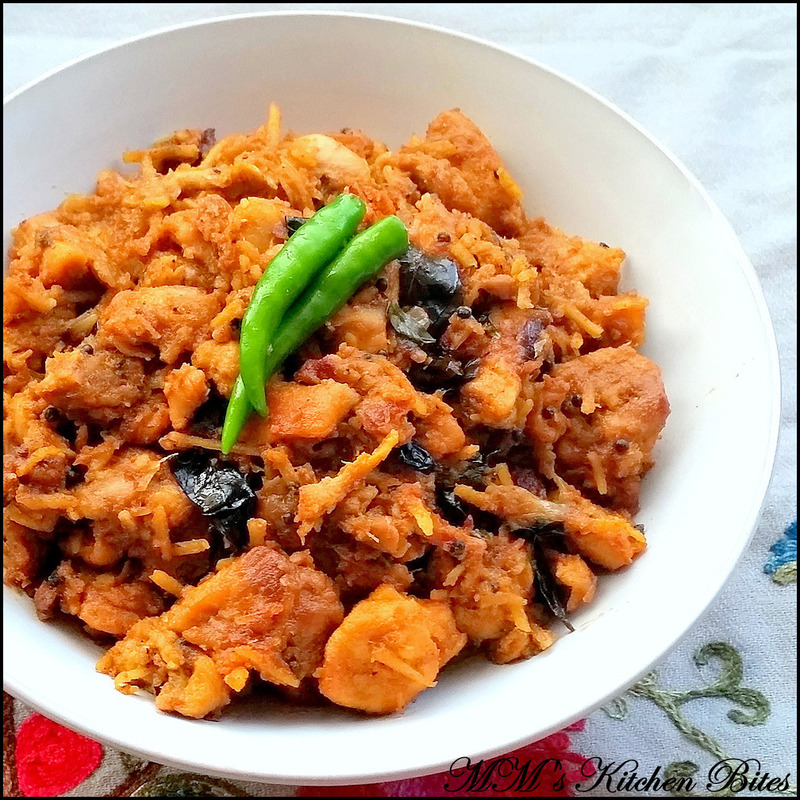 (Traditionally chicken is not marinated for this recipe, but I almost always marinate the chicken – since chicken cooks quickly and marinating first improves the flavors). Bring the chicken back to room temperature before cooking. In a pan/skillet/kadhai, toast the coconut till it is just beginning to change colour to pale brown (again, traditionally coconut is not toasted first but we like it better toasted first). Remove the coconut from heat and mix in the curry leaves, black pepper, coriander powder and kashmiri red chili powder. Mix everything well and keep aside. In the same pan, heat 2 tbsp oil and add mustard seeds. When the mustard seeds start spluttering, add in 1 ½ cup of shallots/onions. Fry the shallots till they turn golden brown. Add in the curry leaves, whole red chilies, ginger, garlic and green chilies. Stir and sauté for a minute. Add in the balance 1 ½ cups of onions and sauté till onions start to turn golden on the edges. Add in the marinated chicken and toss well on high heat for a couple of minutes. Lower the heat, cover the pan and let the chicken cook in its own juices for about 15 minutes. Remove the cover, stir in the coconut mix and salt. Cover again for about 5-7 minutes. Remove the lid, add the remaining 1 tbsp oil and toss the chicken well. Sauté and stir the chicken till all the water evaporates and oil starts shimmering on the sides of the pan – about 5-10 minutes. Serve hot with paranthas or ghee rice. Lightly dry roast all the spices on low heat, cool and then grind to a fine powder. Use as required and store the balance in an airtight container.